4. Some cute, comfortable leggings – For those who spend a lot of time resting, wearing something that feels cute while also being like pajamas is wonderful! There are so many patterns to choose from in these leggings. 5. An acupressure mat – These are great for pain relief with chronic illness. 6. Offer to pay for some supplements or treatment for a portion of time. I can’t tell you what a blessing it would be to have even a week’s worth of supplements paid for by a friend or family member! 7. A Bluetooth speaker can be a useful tool for those who spend a lot of time detoxing while listening to music or podcasts. Doing detox treatments can get boring fast, so listening to something can help pass the time! 8. A heating pad – Even if they already have one, an additional heating pad can be incredibly beneficial for those dealing with chronic pain. I only have one, and while I’m using it on one area I often wish I had a second one to use for a different place of pain. 9. Scripture wall art – Having scripture posted around my house helps remind me of who God is and how he’s working in my life, even through the ups and downs of suffering. Wall art like this can be encouraging to someone who is going through difficult times with chronic illness. 11. Money for a date night – Money can be tight for those with chronic illnesses, so it could be a big blessing to give money to someone who could use a date night out (or in) with their spouse or significant other. 12. An Amazon Kindle – Kindles can be helpful for those who spend a lot of time stuck at home or in bed. You can use them to get on the internet, play games, and read. At times of intense arthritis, my hands hurt too much to hold a book. 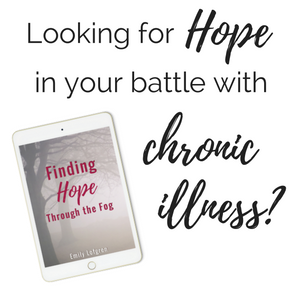 Propping up the Kindle is a great way to still read when books are too much for someone with a chronic illness. 13. Fuzzy socks – These socks are super cute and warm! Last year, I had a gift basket given to me that included a couple pairs of fuzzy socks, some Epsom salt, and a coloring book. I loved this gift! The Vulnerability of Answering the Question, "How are you?" Wow Emily this is Amazing and never would have thought of this idea. I have really enojoyed reading. I want to let you know that I saw this on Dystonia Awareness Facebook page. They felt it would be helpful. Thank you so much it was actually fun. God Bless and I will most definitely share ❤️❤️ Merry Christmas 🎄 You will be in my prayers. (1) stands/holders for elevating books & keeping them open or for use on counters when working in the kitchen or just when sitting down to read? (2) stands for elevating phones, tablets, or laptops? These are excellent ideas, Linda!! I haven’t searched for or found those, but I’ll definitely look for them in the future. Those seem like they’d be a big help for a lot of people! Especially the stands/holders for books. At certain points, my hands hurt too much to hold a book. Even now they’d be nice! Thanks a bunch, Emma! :) Glad to hear you also like the scripture wall art. I love having precious reminders of God’s Word present around the house! This is a great list! I have an instapot and love it. I am going to look up the accupressure mat! I made pulled pork in it tonight – took an hour where it sits all day in my crockpot or smoker! You will be very happy with it I am sure! Thanks, Hailey!! Awesome – Most people who have them rave about them!